The latest reviewed version was checked on 25 May 2017. There are template/file changes awaiting review. In Microsoft Word, go to Page Layout, Page Setup, Pages, Multiple Pages and choose 'Book fold' then print (save to PDF won't combine multiple pages to one sheet or in book fold order). For distribution online but for others to download and print themselves, save (or print to PDF) from your word processor, then open in Adobe Reader then print 'booklet' settings to PDF printer. LibreOffice Write, Return to Print dialog, and click the Page Layout tab page. Select Brochure. This is easy to do, and if you're using a word-processor it's quite straightforward to get the software to do two columns and print out very appropriately. The page numbering in the diagram to the left is for a one-sheet zine. You'll probably want more than four sides to write on so you'll probably need to attach multiple sheets together. Note that some of the pages are upside-down relative to each other, so you probably can't do this very straightforwardly on a word-processor. But you like cut-and-pasting, yes? If you want this to become a booklet-style paged thing (a "codex") you'll need to make a couple of cuts after you've attached the pages together. One nice thing about folding into six is that with standard paper sizes like A4, you get a roughly square zine at the end of it, which is quite nice. First fold the sheet into a Z-like shape (i.e. fold it 1/3 and 2/3 of the way along, in a zigzag). Then fold it once the other way. This gives 12 approximately square sides. If you're making a big batch of zines then you're probably going to be doing a lot of cutting, either to separate the pages or to trim things or whatever. It can get a bit tedious and slow to do it all with scissors, but if you go to a largeish stationer's you can buy a cheap guillotine which will make things easier. I've seen a lot of multi-page zines where the pages are not attached to each other, and generally that can work OK. It's certainly easier, but of course the zine is in danger of falling apart. It's up to you, of course. Stapling it yourself is easy to do and nice and cheap. You might find that a normal stapler only-just-doesn't-quite-reach to the middle of your page... argh! If you go to a largeish stationery shop you can easily find a long-arm stapler which can make life a lot easier. A library or university nearby might also have one you can use if you ask (try bringing your own staples). Or if you don't have the money you can use a normal stapler folded out flat to push the staples though the paper into a soft surface, like carpet or dense foam. Once you have done that you can then fold the staple down with something flat like a ruler or blunt knife - a sharp knife can mark or cut the pages by accident, or you! If you're doing really big fat zines (more than about 20 pages to attach together, at a guess) then sometimes you can knacker (create technical problems) the stapler by trying to do too much. 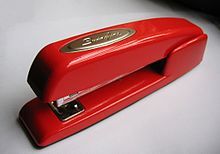 You can buy heavy-duty staplers if you want to do lots of really big fat zines. One nice thing about some fancy photocopiers is that they can do automatic stapling, so if you have access to one of those then this can be a nice easy option. You might have to pay more for this of course. You can make holes (often 3 or 5 holes is good) down the spine of the page and use ordinary needle and thread to bind the pages together. For example, if you make three holes, you would create a kind of tight figure-of-eight loop through the holes. This can bind things very nicely. This is the basis of making a nicely-bound book, so it's useful to know how to do this if you want to self-publish your epic novel. There's at least one reference on DIY book-binding in the other resources section of this book. You can use a hole-punch to make one, or two, holes through the pages, and then tie a loop of string through to connect the pages. Don't make the loop too tight or no-one will be able to turn the pages properly. If you're printing onto a single page you can use clever folding and/or cutting to make a nice zine layout without needing to bind things. If you take a piece of paper and fold it in half, then fold it in half again, you have 8 sides. You'd need to make a cut (along the line of the first fold) to make them into a booklet-like codex, but this gives you two separate pieces. One nice trick you can manage is to not make the cut all the way through - leave a small amount of un-cut paper in the middle, and this lets people turn the pages without completely separating the pieces. This doesn't give a booklet-like result (more of a thing to be folded out) unless you do some cutting. But it's easy to do and who knows, maybe it suits your purposes.